A few weeks ago, I was kindly invited to the Brighton Blog Meet being hosted by the lovely Laura. I couldn't wait because I didn't realise quite how many bloggers there were from my hometown, or the south east area in general! Obviously, this made me very happy to know I have some blog neighbours! Not literally, but y'know.. I arrived very nervously at the venue, as I hadn't been to a meet/event on my lonesome in a while, I'd kind of forgotten what to expect. Soon enough, I got chatting to some lovely girls Amy, Hazel and Rosie who had the same idea hanging around by the entrance and sticking together! Shortly after that, we were given ice-breaker sheet by Laura (who I didn't recognise to begin with.. Sorry Laura!) to get to know other bloggers in the room, such as what categories of blogging they fell into. It was quite apparent that everyone had their own little groups already, but everyone was very sociable and SO nice which created such a friendly atmosphere! I also finally met Holly who I exchanged chats with on Twitter a fair bit beforehand. I couldn't help but admire the epic flash on her camera! She even lent me 5p and let me have some of her Ibuprofen because I'm clearly a tragic lost cause and haven't got my life together what-so-ever. Thanks Holly! There were a number of brands at the meet such as Homage, Snact and Purepotions, which were all fairly local to the Brighton area. Each one had their own quirky, individual theme which I really loved. Homage were the first brand to catch my eye coming in. I'd already checked them out online beforehand so I was excited to see their stuff in person. They are a independant home and lifestyle store with some stunning bits, who's shop fits cosily into the Seven Dials of Brighton. It is run by a couple Mark & Liza, who have just recently re-located to Brighton from London. Can I just say what a fab job they have done?! 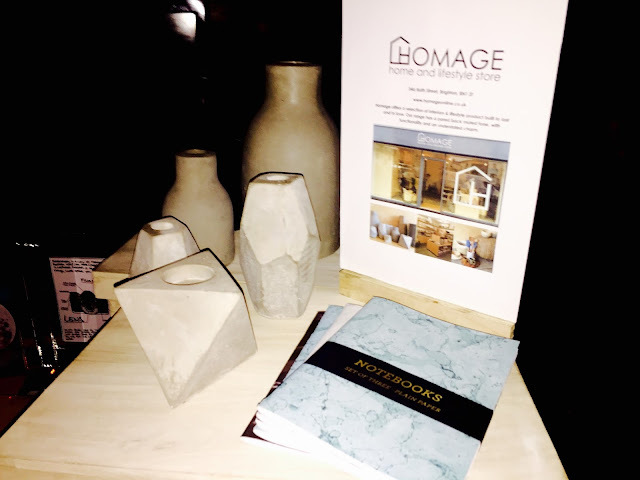 If you live local to the area then make sure you check out Homage if you're passing by, you will not be disappointed! Alternatively, if you're not local - their online store is just as beautiful. The goodie bag was definitely a generous one! I love the cute, little pouch and that they've also included a mish mash of products ranging from face wipes and lip balm, to a lovely little notepad. 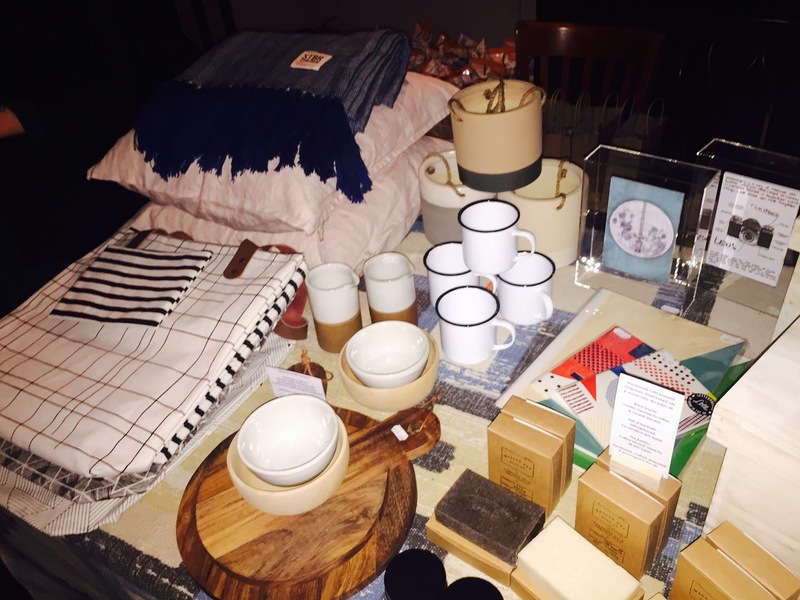 I love the chic designs on their textiles and how much of a warm, yet unique & homely feeling you get from just looking at their homeware. Another great thing about Homage is their affordable prices, depending on what you're buying of course! At my next opportunity, I am definitely going to pop in and make a couple of purchases. 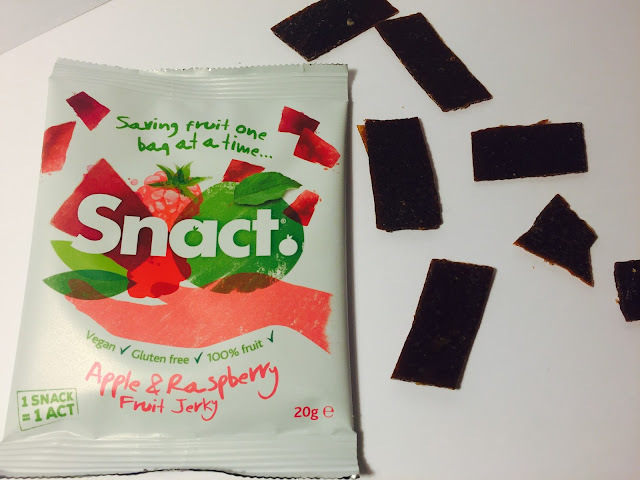 The next brand I came across were the London based company, Snact. Now, this brand really interested me as I love trying to be healthy and I am constantly on the lookout for fruit alternatives. I am very lazy when it comes to buying/eating physical fruit and sometimes I can't always be bothered to lug it round when I'm on the go. This is where Snact come in. It's basically fruit jerky which is made from all of the perfectly good surplus fruit that is either too small, too big or just the pieces that aren't pretty enough to make it onto the shelves. (I did actually feel slightly sad when I thought about all the sad-faced pieces of fruit being turned away) Lol, get a life Tania. They are 100% fruit, gluten free and suitable for vegans. Not only that, they are one of your five-a-day. I'm not even kidding, when I started eating these I had 5 bags in one go - they are so moreish! If you're not a big fruit lover yourself, I couldn't recommend these more for you to try. 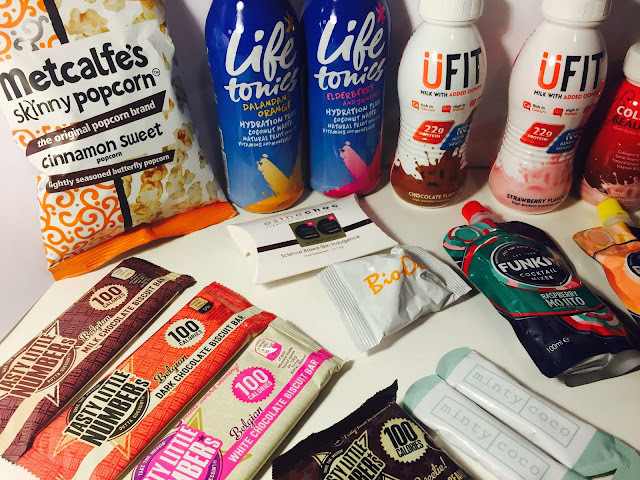 It feels like you're eating a packet of sweets, but much more guilt-free! 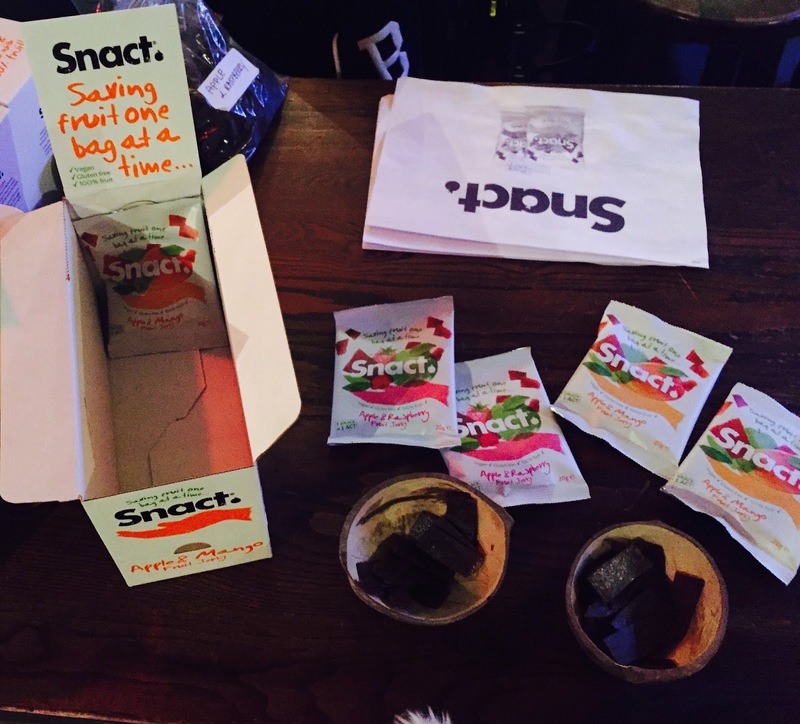 I also love knowing that Snact are combatting waste, aswell as being such an easy size to pop in your bag for when you're on the go. Needless to say, I am definitely stocking up when I pop into town next! 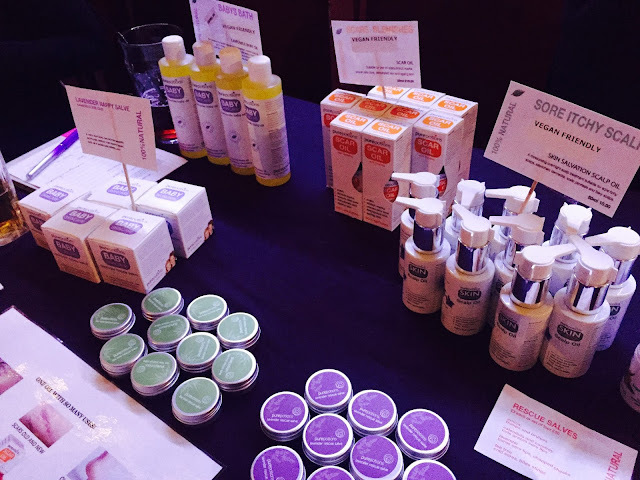 Purepotions were the final brand I got chatting to. 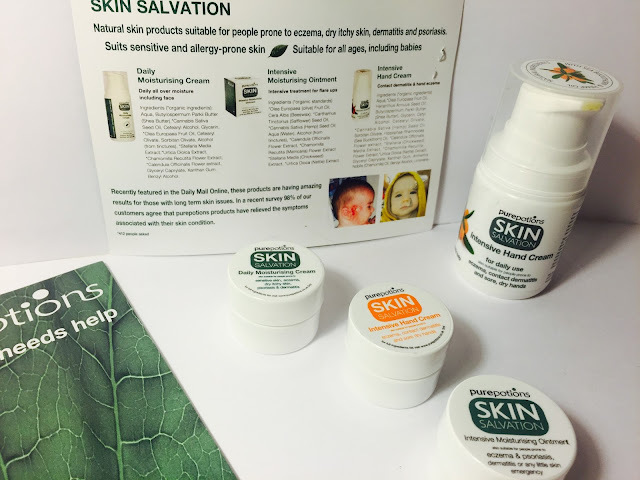 Their main focus is people with dry skin and have even been tested on people with Eczema, Psoriasis, Dermatitis and any other dry, itchy skin conditions. All their ingredients are natural (mostly organic), made in the UK and not tested on animals. They are also fragrance free and paraben free, with absolutely nothing unnecessary added to the products. Each blogger got given a Skin Salvation Sample Pack which included the Intensive Hand Cream, Daily Moisturising Cream and Intensive Moisturising Ointment. The hand cream appealed to me the most, especially as my hands normally look like a shrivelled up lizard where they get so dry. I used a bit when I was there and instantly noticed a difference. It doesn't leave a greasy feel afterwards unlike most intensive moisturisers, so that pleased me immensely! They are a perfect size to travel around in your bag with you or just to keep easily stored. 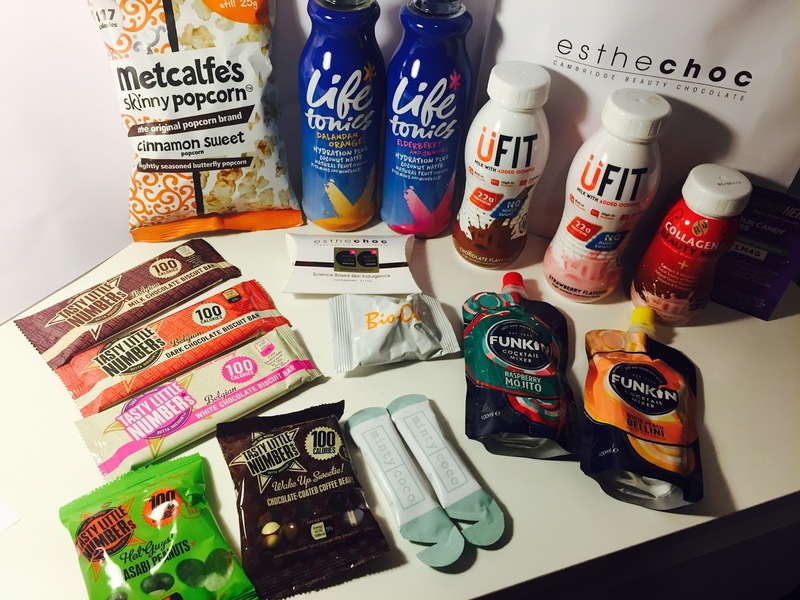 If you are not sure if a product will work for you, the sample pack is only £5 and you get 3 different things to try before you buy. Definitely something to look out for if you have dry skin. After we had all got to know each other, we got stuck right into the raffle. Laura's chosen charity was Grassroots Suicide Prevention, which I think is such a worthy cause. I think everyone has lost, or at least knows of someone who has been affected by suicide and it's really good to know there are people out there who want to help and could ultimately help prevent someone taking their own life in the future. We all ended up raising over £100 too, which is pretty amazing and the winners walked away with some fab prizes! At the end of the afternoon, we all parted ways and got given the most incredibly, generous goody bags I have ever received from Laura - so massive thank you to her again and to all of the brands! 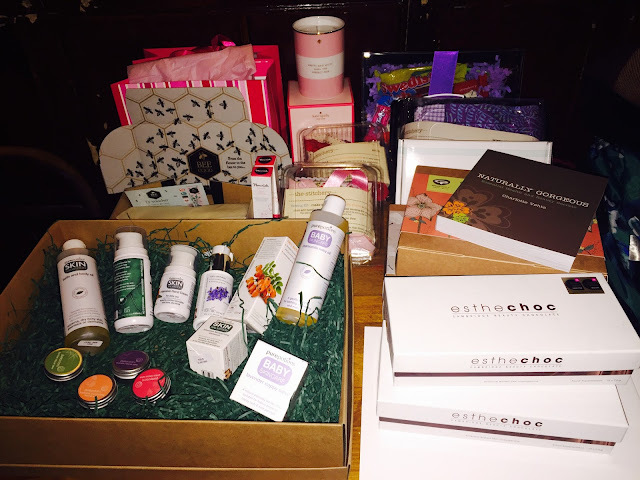 The brands included Amara, Anatomicals, Bee Good, Bio-Oil, Body Fantasies, Blogosphere Magazine, Candy Hero, Chill, Chroma Stationary, Collagen Drinks, Crafty Creatives, Esthechoc, Funkin Cocktails, Green People, Life Tonics, Lylia Rose, Metcalfe's Skinny, Minty Coco, MooGoo, Prairie Charms, Stigu, Tasty Little Numbers, Timeless Truth, Ufit and Wick Hove. 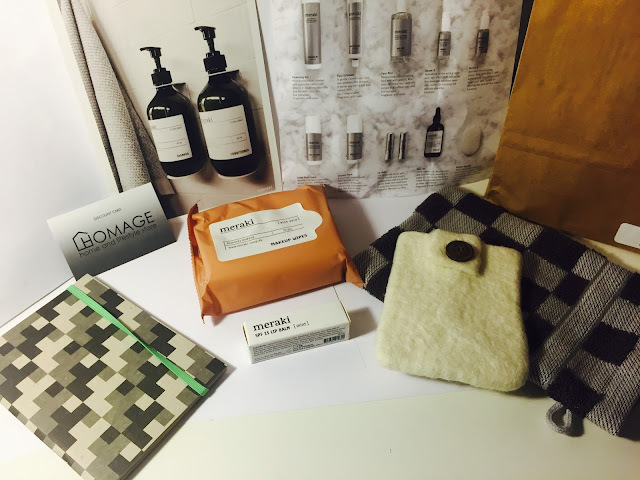 I am still in the midst of trying out each individual thing from this enormous bag, so I will keep you updated and definitely let you know what products I loved as and when! With that being said, here are a few that I have tried and taking a strong liking to! These Anatomicals face masks were one of the first things that caught my eye during my rummage. I love a good pun and the Grease one really got me lolling (.. and singing for the rest of the day!) These little gems are only 99p each.. (Yes, you did read that right!!) and are sold in the likes of Tesco, Morrisons, Asda, ASOS etc. 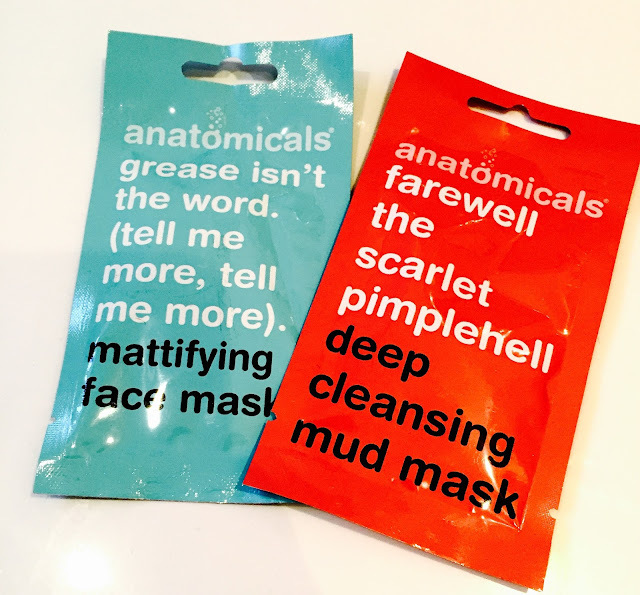 I used the Mattifying Face Mask first, as Turquoise is my favourite colour and Grease is a bloody classic (not when it's on your face though!) 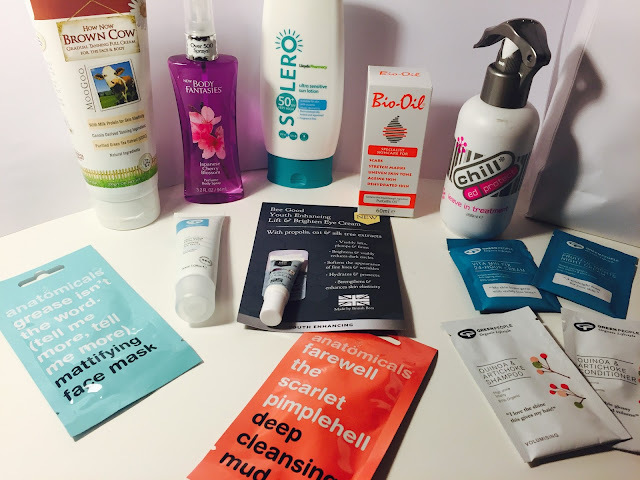 I always struggle with a bit of an oily t-zone and the rest of my face is just stuck in a permanent confusion, so I find it hard to get skincare products just right. This claims to fight off any excess sebum without drying out the rest of your face. I can genuinely say it does just that! It's a creamy formula which is so easy and gentle to apply and I feel like my skin was getting a good clean but also moisturised at the same time. A few days later, I had a bit of a hormonal breakout on my face, so I thought what better time than to whack out the Deep Cleansing Mud Mask. Sometimes, I feel like my face really needs a good in-depth cleanse and with this being a mud mask, I knew it would help do just that. You are advised to use the whole packet, so I popped it all on my face for 10-15 minutes and relaxed in the bath. After taking it off and starting the rest of my skincare routine, I literally felt such a difference on my face. It looked and felt clean, and my pores seemed a lot less clogged up. I absolutely need a lifetime supply of these and I may actually be converted from my Lush face masks..
One thing I've been needing to get my hands on for ages is a planner, so I was overjoyed when Stick To Stigu was popped into my goody bag! Before this, I was so ridiculously unorganised with the plans and arrangements I'd made, that it seemed impossible to keep up, let alone trying to remember anything important that needed doing. This annual planner is a breath of fresh air and is separated into weeks to make keeping on top of things much easier. Not only that, at the start of each new week there are quick and easy motivating tips and tricks to try out - all to help you feel that little less stressed and more relaxed in your mind. I lead a very demanding, sometimes stressful lifestyle and I find it very hard to remember what I'm doing, so I couldn't be more grateful for being introduced to such a wonderful creation. I absolutely love this, as it adds so much more character and motivation to your standard planner/diary. I also love the quirky little quotes that appear at the top of the pages too. 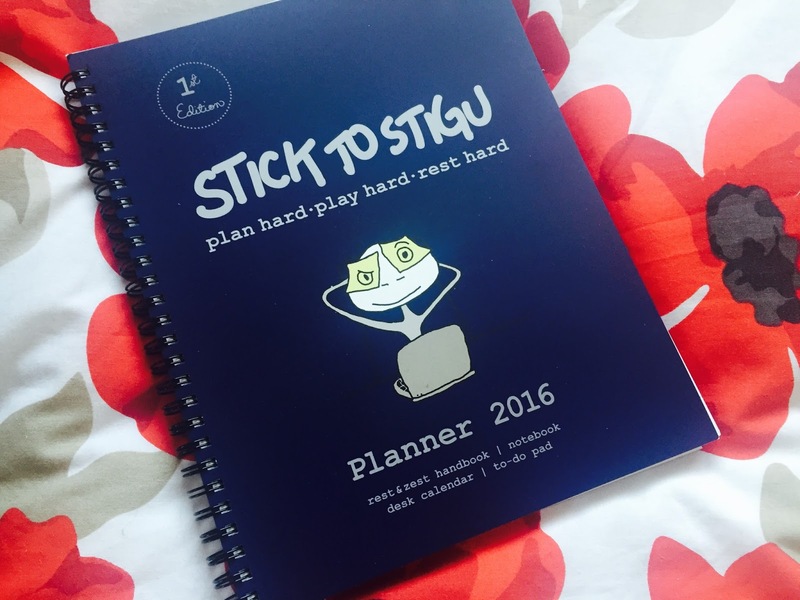 I basically love everything Stigu stand for that I don't think I'll use another planner ever again! Big love! Overall, I had a fab time at the meet and met SO many lovely people. I can't wait for the next one! Really it is motivating tips and tricks and need to try this. Looks like you had a great time and so many brands there to discover. I can't wait to come see you in Brighton next month.